Infographic: Why is it a struggle to adequately staff schools? This report is the second in a series examining the magnitude of the teacher shortage and the working conditions and other factors that contribute to the shortage. What this series finds: The teacher shortage is real, large and growing, and worse than we thought. When indicators of teacher quality (certification, relevant training, experience, etc.) are taken into account, the shortage is even more acute than currently estimated, with high-poverty schools suffering the most from the shortage of credentialed teachers. What this report finds: This report describes the challenges schools face in staffing themselves, both as a consequence of the teacher shortage and further contributing to it. It shows that a high share of public school teachers are leaving their posts: 13.8 percent are either leaving their school or leaving teaching altogether, according to most recent data. It also shows that schools are having a harder time filling the vacancies that turnover, attrition, and other factors (like increasing student enrollment or broadened curriculums) create. The share of schools that were trying to fill a vacancy but couldn’t tripled from the 2011–2012 to 2015–2016 school years (increasing from 3.1 to 9.4 percent), and in the same period the share of schools that found it very difficult to fill a vacancy nearly doubled (from 19.7 to 36.2 percent). These difficulties are also shaped by a dwindling pool of applicants to fill vacancies. 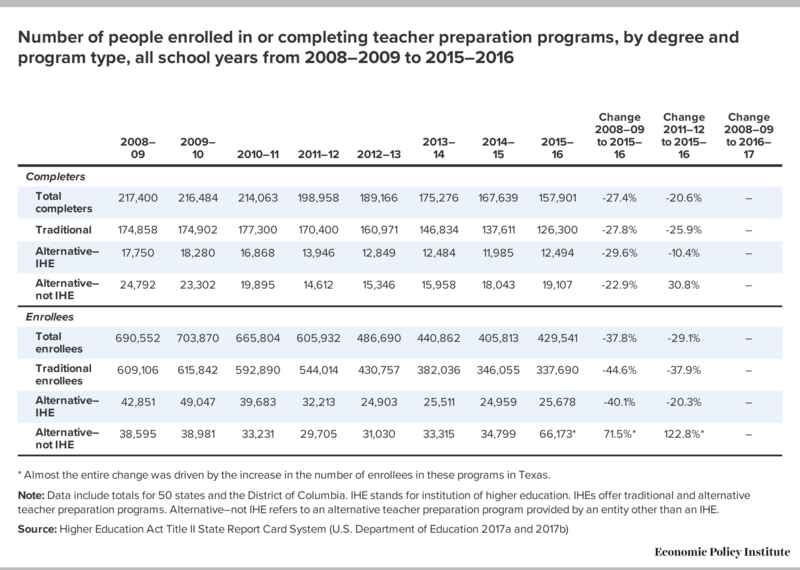 From the 2008–2009 to 2015–2016 school years, there was a 15.4 percent drop in the number of education degrees awarded and a 27.4 percent drop in the number of people who completed a teacher preparation program. Schools are also having a harder time retaining credentialed teachers: that can be seen in the small but growing share of all teachers who are newly hired and in their first year of teaching (4.7 percent) and in the substantial shares of teachers who quit who are certified and experienced. All these challenges are more acute for high-poverty schools. Why it matters: A shortage of teachers harms students, teachers, and the public education system as a whole. Lack of sufficient, qualified teachers and the staff instability that accompanies turnover threaten students’ ability to learn and reduce teachers’ effectiveness, and high teacher turnover consumes economic resources that could be better deployed elsewhere. The teacher shortage makes it more difficult to build a solid reputation for teaching and to professionalize it, which further contributes to perpetuating the shortage. In addition, the fact that the shortage is distributed so unevenly among students of different socioeconomic backgrounds challenges the U.S. education system’s goal of providing a sound education equitably to all children. What we can do about it: Tackle the working conditions and other factors that are prompting teachers to quit and dissuading people from entering the profession, thus making it harder for school districts to retain and attract highly qualified teachers: low pay, a challenging school environment, and weak professional development support and recognition. In addition to tackling these factors for all schools, we must provide extra supports and funding to high-poverty schools, where teacher shortages are even more of a problem. The teacher shortage in the nation’s K–12 schools is an increasingly recognized but still poorly understood crisis: The shortage is recognized by the media and policymakers, and researchers have estimated the size of the shortage—about 110,000 teachers in the 2017–2018 school year, up from no shortage before 2013 (Sutcher, Darling-Hammond, and Carver-Thomas 2016).1 But the shortage is poorly understood because the reasons for it are complex and interdependent. The shortage occurs because there is an insufficient number of credentialed teachers to fill vacancies at schools. Unfilled vacancies happen for any number of reason, including reduced attractiveness of teaching as a profession, increases in school enrollment, reductions in class sizes, and excessive number of teachers leaving their schools. The teacher shortage constitutes a crisis because of its negative effects on students, teachers, and the education system at large. This crisis calls for urgent, comprehensive, and sustainable policy solutions. The first report in this series, The Teacher Shortage Is Real, Large and Growing, and Worse Than We Thought (García and Weiss 2019a), established that current national estimates of the teacher shortage likely understate the magnitude of the problem: When issues such as teacher qualifications and the unequal distribution of highly credentialed teachers across high- and low-poverty schools are taken into consideration, the teacher shortage problem is much more severe than previously recognized. Building on that research, and using the same quality and equity angles, this paper examines challenges schools are facing in trying to recruit, hire, and retain sufficient, qualified teachers, with a particular focus on high-poverty schools, where those struggles are heightened. This report shows that schools’ staffing efforts are challenged by teachers leaving the profession at high rates and by the reduced pipeline of new teachers as fewer people have entered teaching preparedness pathways in recent years. We also present data suggesting that teachers entering the profession don’t have the same qualifications their peers in years past had, due to the proliferation of nontraditional teacher preparation programs and changes in the requirements for obtaining an initial teaching certificate. We also show staffing trends are affecting the qualifications held by the teaching workforce overall: A lot of teachers quit teaching and some of the teachers who quit are as credentialed or more credentialed than the teachers who stay, and the share of all teachers who are inexperienced has increased over time. These challenges and changes in the aggregate qualification of the teaching labor force manifest in schools in many ways. Schools are reporting difficulties in staffing their schools and are leaving vacancies unfilled despite actively trying to hire for them. Over time the share of teachers who are newly hired has increased as has the share of teachers who are newly hired and in their first year of teaching. High-poverty schools are hit hardest: They find it harder to fill vacancies than low-poverty schools and schools overall, and they experience higher turnover and attrition than low-poverty schools. These findings suggest that efforts to address teacher shortages must consider how schools are affected by both teacher attrition and turnover and by the shrinking pipeline of new potential teachers and the factors that have eroded the appeal of—and regard for—teaching as a profession for both incoming and acting teachers. How do struggles to recruit and hire drive the teacher shortage, and why is the shortage a concern? Net of some of the external or institutional factors just mentioned, the staffing problem arises when vacancies occur against a backdrop of high rates of teacher attrition (teachers quitting teaching altogether) and turnover (teachers leaving their position to another position or school) and a shrinking pool of new teachers with the needed qualifications due to a waning interest in a teaching career. Indeed, high attrition and a dwindling pool of applicants are the two most troubling dynamics of the education labor market and are largely driving the teacher shortage and hence are largely responsible for the costs and consequences of the teacher shortage (Ingersoll 2004, 2014; Sutcher, Darling-Hammond, and Carver-Thomas 2016; Darling-Hammond et al. 2017). In this report, we examine the challenges schools face accessing a sufficient pool of qualified applicants, filling vacancies that arise, and retaining credentialed teachers. We also identify disparities in recruitment and attrition between high- and low-poverty schools, which should be expected, given the substantial disparities between working conditions in high-poverty schools and in low-poverty schools (as examined in the forthcoming reports in this series). How easy or hard it is for schools to recruit and hire strong teachers to fill open positions depends in part on the size and qualifications of the pool of potential new teachers. That is why changes to the pool of potential new teachers, to how well teachers in the pool were prepared, to what requirements they had to meet to access a teaching credential, and to the total number of teachers who need to be recruited all affect the ease or difficulty of filling openings in a school. The diminishing pool of applicants and changes in the characteristics of those applicants over time help to explain some of the challenges to recruitment. Schools will struggle to staff their ranks with well-prepared teachers if fewer individuals are attracted into teaching or if their training and preparation have weakened. While requirements vary state to state, generally someone must earn a bachelor’s degree from an accredited institution and complete a teacher preparation program (or “teacher certification program,” as referred to in our last report) to be eligible to obtain a certificate to teach. (Teacher preparation programs prepare candidates to meet certification requirements but do not award certificates—only the state can do that. Candidates may complete a program but fail to pass the required certification tests or may fail to meet some other requirements to earn the certification.) All teachers need a bachelor’s degree, but not all teachers need a bachelor’s degree in education. However, a bachelor’s degree in education is a common route into teaching because the teacher preparation program is completed as part of the education major. Persons who wish to be teachers but who did not major in education as an undergraduate may pursue a master’s degree in education or may enroll in an alternative teacher preparation program. Teachers also pursue master’s degrees and doctorates to advance their education. For these reasons, we can glean insights into the popularity of teaching and the strength of the teacher pipeline by looking at the number of people pursing education degrees and enrolling in teacher preparation programs (see footnote 6 and table notes for descriptions of the types of teacher preparation programs). Note: Data for other years are available in Appendix Tables 1 and 2 at the end of this report. Table 1 further unpacks these sharp reductions and provides context. For example it shows that not only did the number of people awarded education degrees fall, the share of education degrees awarded as a percentage of all degrees awarded fell, with the exception of Ph.D.s. (Ph.D.s increased in both total number of degrees and as a share of degrees awarded but constitute a very small percentage of education degrees awarded.) Of all the bachelor’s degrees awarded in 2015–2016, 4.5 percent were in the field of education; of all the master’s degrees awarded, 18.6 percent were in education. These shares were 1.8 and 8.4 percentage points smaller than in 2008–2009, before the teacher shortage crisis developed. (During the 2008–2009 school year school systems were just starting to grapple with the economic recession, which led to big cuts in school spending that in some cases have yet to be fully restored, as noted in Leachman, Masterson and Figueroa 2017 and Leachman and Figueroa 2019). To put it another way, in percent terms, bachelor’s and master’s degrees in education awarded as a share of all degrees fell by roughly a third (28.5 percent and 31.2 percent, respectively) from 2008–2009 to 2015–2016. * Almost the entire change is driven by the increase in the number of enrollees in these programs in Texas. Note: Data include totals for 50 states and the District of Columbia. IHE stands for institution of higher education. IHEs offer traditional and alternative teacher preparation programs. Alternative–not IHE refers to an alternative teacher preparation program provided by an entity other than an IHE. Data for other years are available in Appendix Tables 1 and 2 at the end of this report. Source: Digest of Education Statistics 2018 Table 322.10, Table 323.10, and Table 324.10 (NCES 2018) and Higher Education Act Title II State Report Card System (U.S. Department of Education 2017a and 2017b) . Other factors that influence the qualifications of the teacher workforce include changes in the standards for becoming a teacher such as licensure examinations and the requirements of preparation programs. Our exploration of Title II data from the U.S. Department of Education (2017c and 2017d) identifies certain trends that could negatively affect teacher qualifications (although more detailed qualitative work would be needed to assess the reasons for, and net impact of, the changes, which is beyond of the scope of this report). Nevertheless, we found that the number of states requiring content-specific bachelor’s degrees for initial teaching credentials decreased. (If a state requires a content-specific bachelor’s degree, that generally means that if a teacher is to teach a specific subject, such as math, the teacher must have majored in that subject.) Of states with data in 2008–2009 and 2015–2016, fewer states required a content-specific bachelor’s for elementary, middle-level, and secondary level certificates in 2015–2016. Examining the requirements across all initial certificates available, we also noted a large decrease in the share initial teaching certificates requiring a content-specific bachelor’s degree for middle school, which fell from 38.6 percent to 22.8 percent of all initial certificates, a 15.8 percentage-points decrease. Over the same period there were also drops in the share of initial certificates requiring performance assessments (down 16.2 percentage points), supervised clinical experience (down 10.8 percentage points), or a police record examination (down 17.2 percentage points) in order to earn a teaching certificate. However, there was an increase in the share of initial certificates requiring “prescribed coursework” (up 10.8 percentage points) in order to get a teaching certificate. As shown in Table 2, a large majority of schools report having vacancies to fill, so most are hiring at a given time (about eight in 10 schools report having vacancies for the 2015–2016 school year). And nearly one in 10 (9.4 percent) of those schools that were trying to hire said they were unable to fill a vacancy in at least one field (math, English, etc.) in the 2015–2016 school year. Finally, over a third (36.2 percent) of schools trying to fill vacancies report finding it very difficult to fill a vacancy in at least one field. Note: Data are for public noncharter schools and are based on a count of schools, not on the total number of vacancies or the number of teachers the school failed to hire. All principals are asked whether their school has or does not have any vacancies (“teaching positions for which teachers were recruited and interviewed by this school’s hiring authority”). The shares reported in the table represent the share of schools that had any vacancies, and, for those with vacancies, the share of schools that could not fill a vacancy in at least one of the fields listed on the questionnaire, and the share of schools that filled a vacancy but found it "very difficult" in at least one of the fields. Fields included were: (1) general elementary, (2) special education, (3) English or language arts, (4) social studies, (5) computer science, (6) mathematics, (7) biology or life sciences, (8) physical sciences, (9) ESL or bilingual education, (10) foreign languages, (11) music or art, (12) career or technical, and (13) other. A principal is in a low-poverty school if less than 25 percent of the student body in his/her school is eligible for free or reduced-price lunch programs; a principal is in a high-poverty school if 50 percent or more of the student body is his/her school is eligible for those programs. 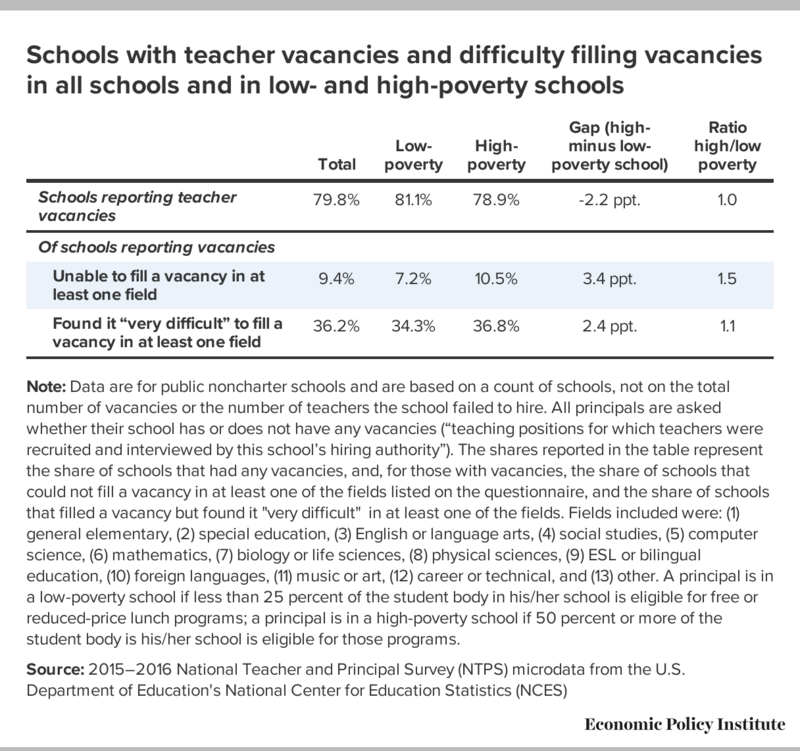 The data also show that while high-poverty schools were less likely to be hiring than their low-poverty counterparts (i.e., fewer of them reported having teaching vacancies for which teachers were recruited and interviewed), high-poverty schools with vacancies found it more difficult to hire teachers. Well over a third (36.8 percent) of high-poverty schools with vacancies reported that it was “very difficult” to fill at least one of their vacancies versus 34.3 percent of low-poverty schools. There are also differences between high- and low-poverty schools in the share that are unable to fill vacancies. While these differences are small in absolute terms, they are relatively large. For example, the share of high-poverty schools that had vacancies and report being unable to fill teaching positions in at least one field is 10.5 percent, but this share is greater than the 7.2 percent share in low-poverty schools. One consequence of this greater challenge in high-poverty schools is their higher share of brand new teachers and teachers who are new hires. Here our analysis coincides with what Sorensen and Ladd found in their 2018 study. The share of all teachers who were newly hired teachers (new to the school completing the survey) was 11.2 percent, on average, in the 2015–2016 school year (Table 3). But that share was two percentage points higher in high-poverty schools (12.1 percent versus 10.1 percent in low-poverty schools). 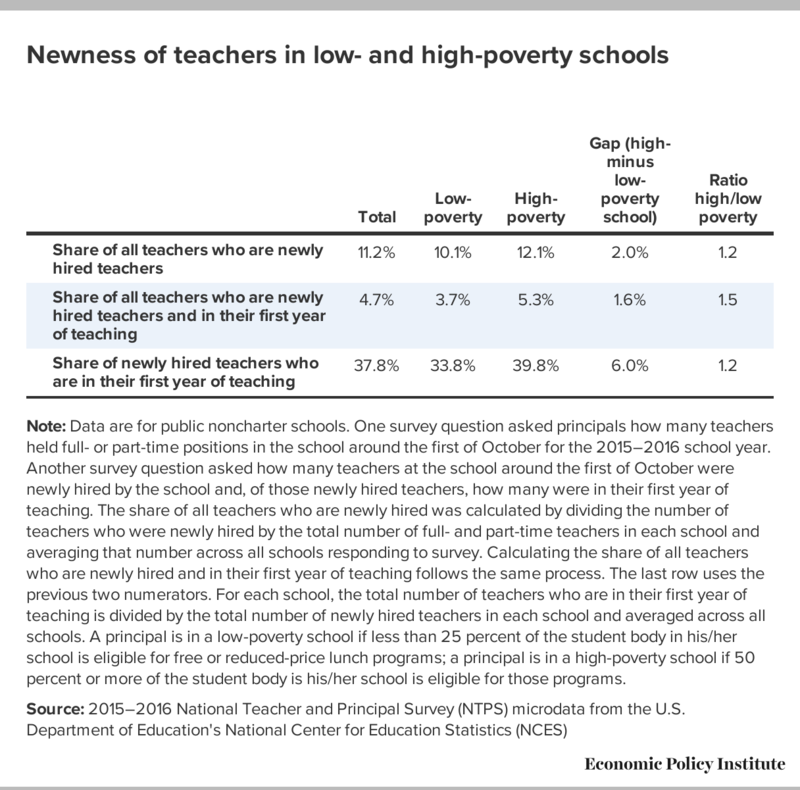 And, when we look at the share of all teachers who are not only newly hired teachers but in their first year of teaching, we see again that the share is higher in high-poverty schools (5.3 percent versus 3.7 percent). Finally, in high-poverty schools, the share of newly hired teachers who are in their first year of teaching is much higher than in low-poverty schools (39.8 percent versus just 33.8 percent). Although the differences are small in relative terms, these three measures together point to an added source of disadvantage for low-income children and the schools that serve them. Note: Data are for public noncharter schools. One survey question asked principals how many teachers held full- or part-time positions in the school around the first of October for the 2015–2016 school year. Another survey question asked how many teachers at the school around the first of October were newly hired by the school and, of those newly hired teachers, how many were in their first year of teaching. The share of all teachers who are newly hired was calculated by dividing the number of teachers who were newly hired by the total number of full- and part-time teachers in each school and averaging that number across all schools responding to survey. Calculating the share of all teachers who are newly hired and in their first year of teaching follows the same process. The last row uses the previous two numerators. For each school, the total number of teachers who are in their first year of teaching is divided by the total number of newly hired teachers in each school and averaged across all schools. A principal is in a low-poverty school if less than 25 percent of the student body in his/her school is eligible for free or reduced-price lunch programs; a principal is in a high-poverty school if 50 percent or more of the student body is his/her school is eligible for those programs. Not only is hiring a challenge, but the data show that it has become substantially harder in the past few years. First, the share of schools reporting any vacancy increased by more than 11 percentage points between the 2011–2012 and 2015–2016 school years (from 67.2 percent to 78.8 percent, top panel Figure B). Even more troubling, the share of schools that were trying to hire but reported an unfilled vacancy in at least one position tripled during this period (from 3.1 percent to 9.4 percent). And the share of hiring schools reporting that they had found it “very difficult” to fill at least one vacancy also increased—almost doubling (from 19.7 percent to 36.2 percent). Relatedly, the share of all teachers who were newly hired teachers increased between the 2011–2012 and 2015–2016 school years (from 7.2 percent to 11.2 percent), as did the share of all teachers who were newly hired and in their first year of teaching (from 4.0 percent to 4.7 percent), indicating that the teaching workforce became less experienced over this period. Note: Data are for public noncharter schools and are based on a count of schools, not on the total number of vacancies or the number of teachers the school failed to hire. All principals were asked whether their school has or does not have any vacancies (“teaching positions for which teachers were recruited and interviewed by this school’s hiring authority”). The shares reported in the table represent the share of schools that had any vacancies, and, for those with vacancies, the share of schools that could not fill a vacancy in at least one of the fields listed on the questionnaire, and the share of schools that filled a vacancy but found it "very difficult" in at least one of the fields. Fields included were: (1) general elementary, (2) special education, (3) English or language arts, (4) social studies, (5) computer science, (6) mathematics, (7) biology or life sciences, (8) physical sciences, (9) ESL or bilingual education, (10) foreign languages, (11) music or art, (12) career or technical, and (13) other. With regard to teachers hired, one survey question asked principals how many teachers held full- or part-time positions in the school around the first of October for the 2015–2016 school year. Another survey question asked how many teachers at the school around the first of October were newly hired by the school and, of those newly hired teachers, how many were in their first year of teaching. The share of all teachers who were newly hired was calculated by dividing the number of teachers who were newly hired by the total number of full- and part-time teachers in each school and averaging that number across all schools responding to survey. Calculating the share of all teachers who were newly hired and in their first year of teaching follows the same process. Excessive attrition is another troubling dynamic plaguing teacher labor markets and a major driver of shortages (Ingersoll 2004, 2014; Sutcher, Darling-Hammond, and Carver-Thomas 2016; Darling-Hammond et al. 2017). Attrition and turnover—leaving the profession altogether or switching schools—are high in teaching in both absolute and relative terms. Turnover and attrition have been increasing over time (Goldring, Taie, and Riddles 2014) and are higher for U.S. teachers than among teachers in other countries (Darling-Hammond et al. 2017).11 Teachers see much higher attrition than their peers in most occupations: About 30 percent of college graduates who became teachers were not in the profession five years later, compared with 14 percent of pharmacists, 16 percent of engineers, and 19 percent of nurses and lawyers (Ingersoll 2014).12 Among the other professions Ingersoll described in his study, the only ones with higher attrition rates are secretaries, child care workers, paralegals, and correctional officers. It is worth noting that these other professions, with the exception of correctional officers, are very heavily female and relatively low paying, unlikely a coincidental association and one that affirms the findings in our later reports in this series about teachers’ insufficient pay, weak supports, and even lack of societal respect. Note: Data are for teachers in public noncharter schools in the 2011–2012 Schools and Staffing Survey (SASS). In the 2012–2013 Teacher Follow-up Survey (TFS), principals were asked about the teachers’ status the year after SASS was administered. Teaching status is coded from the perspective of whether teachers are generating a vacancy in the school the year after the SASS. Teachers who stay at the same school are teachers whose status the year after is “Teaching in this school.” Teachers who left teaching are those who generated a vacancy and are not in the profession (left teaching, on long-term leave, or deceased). 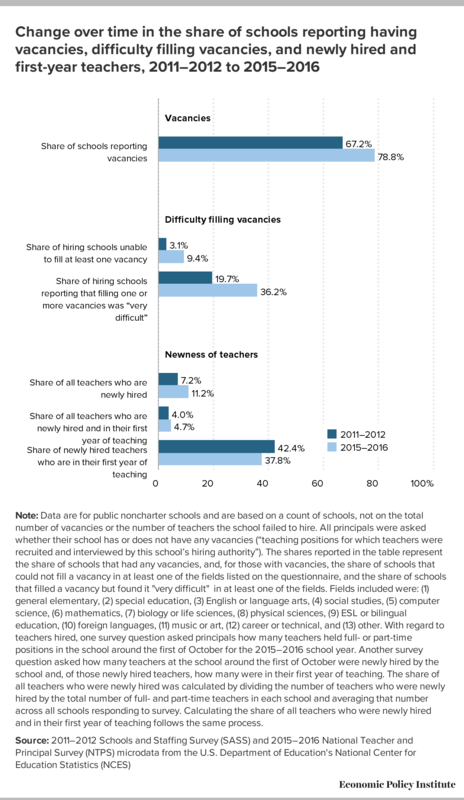 Teachers who generated a vacancy in the school year but are in the profession (teaching in another school or are on short-term leave and returning to the school) are in the "left the school but teaching" category. Note: Data are for teachers in public noncharter schools. According to research and to the U.S. Department of Education, highly qualified teachers have the following four credentials: They are fully certified (with a regular, standard state certificate or advanced professional certificate versus not having completed all the steps); they took a traditional route into teaching (participated in a traditional certification program versus an alternative certification program, the latter of which is defined in the teacher survey questionnaire as “a program that was designed to expedite the transition of nonteachers to a teaching career, for example, a state, district, or university alternative certification program”); they are experienced (have more than five years of experience); and they have a background in the subject of main assignment; i.e., they have a bachelor's or master's degree in the main teaching assignment field (general education, special education, or subject-matter specific degree) versus having no educational background in the subject of main assignment. The table also provides shares of teachers with an additional qualification—certification by the National Board for Professional Teaching Standards (NBPTS) in at least one content area. Teaching status is determined by the reported status of teachers in the Teacher Follow-up Survey conducted for the 2012–2013 school year, one year after the 2011–2012 Schools and Staffing Survey. Teachers who stay at the same school are teachers whose status the year after is “Teaching in this school.” Teachers who left teaching are those who generated a vacancy in the 2012–2013 school year and are not in the profession (they left teaching, were on long-term leave, or were deceased). Teachers who generated a vacancy in the school year but remained in the profession (i.e., left to teach in another school or were on short-term leave and planned to return to the school) are in the "left the school but in teaching" category. 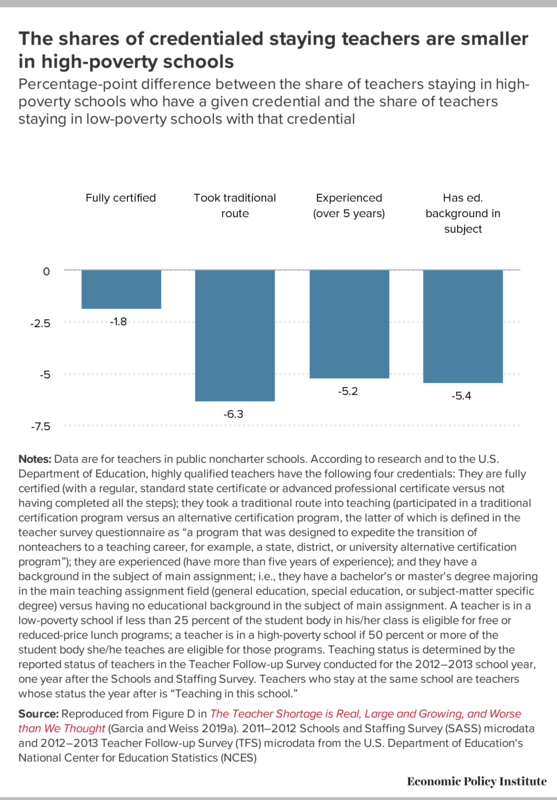 It’s hard to determine exactly how the exit of credentialed teachers affects the qualifications of the teacher labor force overall and in high- and low-poverty schools because the qualifications of the overall teacher pool also depend on the qualifications of the teachers coming into the workforce and into these schools. But as Ladd and Sorensen (2018) find, “all schools experiencing periods of high turnover are more likely to hire not-fully-licensed teachers,” and “schools serving large proportions of low-income student are much more likely to do so. Since schools serving high-poverty student populations already experience above average turnover rates, these differential impacts are particularly worrying” (p. 20). In short, high-poverty schools would need to compensate for these negative trends by hiring greater shares of credentialed teachers to keep up with their wealthier counterparts, and we know that doing so would be extremely unlikely. In practice, the teacher shortage manifests in schools as an inability to be staffed adequately. A school may need to hire more teachers for any one or more of the following reasons: school enrollment increases, teachers leave, the curriculum expands and teachers are needed in new fields, a policy reduces class size, the school’s budget increases, etc. And for any reason or combination of reasons—insufficient teachers coming into teaching, excessive numbers of teachers quitting the profession because of worsening working conditions, etc.—those needed teachers are increasingly difficult for a school to find.19 This imbalance creates a shortage. This report focuses on the challenges schools face filling their vacancies (or meeting their staffing needs) primarily due to two trends: more teachers leaving schools and the profession and fewer people entering the teaching profession. It also raises three concerns on top of the leakage of teachers from the profession and the dwindling pool or potential new teachers. First is the potential change or decline in the qualifications of the teaching workforce, driven by increased churn (turnover and attrition) in the teacher labor market, by changes in the strength of the teaching preparation programs, by alterations in the requirements to accessing an initial teaching credential, and by the slight loss of credentialed teachers who leave the profession. Second is the increased difficulty that schools are having filling vacancies, which in turn has increased the pressure on schools to hire teachers with fewer credentials and thus affected the overall qualifications of the teaching workforce. Third is the fact the high-poverty schools are in an especially difficult position: they are more likely to have vacancies and have a hard time filling vacancies, they are more likely to fill positions with newly hired teachers (and newly hired teachers in their first year of teaching), their teachers are more likely to leave the school or leave the profession, and, as shown in García and Weiss 2019a, they are more likely to face a shortage of highly qualified teachers. In our next reports, we will discuss the factors that make it hard for schools—and especially for high poverty schools—to attract and retain teachers, and, relatedly, why teachers want to leave the profession and why people are less inclined to pursue a teaching career in the first place. In brief, we will show that the supply of new teachers is not meeting the demand at least in part because teacher pay and working conditions and the prestige of teaching are deteriorating. We argue that policymakers are failing to meet the needs of their constituents by failing to address the factors that are prompting teachers to quit and dissuading people from entering the profession, by underestimating what this job involves and by not supporting efforts to professionalize teaching. Emma García is an education economist at the Economic Policy Institute, where she specializes in the economics of education and education policy. Her research focuses on the production of education (cognitive and noncognitive skills); evaluation of educational interventions (early childhood, K–12, and higher education); equity; returns to education; teacher labor markets; and cost-effectiveness and cost–benefit analysis in education. She has held research positions at the Center for Benefit-Cost Studies of Education, the Campaign for Educational Equity, the National Center for the Study of Privatization in Education, and the Community College Research Center; consulted for MDRC, the World Bank, the Inter-American Development Bank, and the National Institute for Early Education Research; and served as an adjunct faculty member at the McCourt School of Public Policy, Georgetown University. She received her Ph.D. in economics and education from Columbia University’s Teachers College. Elaine Weiss is the lead policy analyst for income security at the National Academy of Social Insurance, where she spearheads projects on Social Security, unemployment insurance, and workers’ compensation. Prior to her work at the academy, Weiss was the national coordinator for the Broader Bolder Approach (BBA) to Education, a campaign launched by the Economic Policy Institute, from 2011–2017. BBA promoted a comprehensive, evidence-based set of policies to allow all children to thrive in school and life. Weiss has coauthored and authored EPI and BBA reports on early achievement gaps and the flaws in market-oriented education reforms. She is coauthoring Broader, Bolder, Better, a book with former Massachusetts Secretary of State Paul Reville that will be published by Harvard Education Press in June 2019. Weiss came to BBA from the Pew Charitable Trusts, where she served as project manager for Pew’s Partnership for America’s Economic Success campaign. She has a Ph.D. in public policy from the George Washington University Trachtenberg School and a J.D. from Harvard Law School. Note: Data are for teachers in public noncharter schools in the 2011–2012 Schools and Staffing Survey (SASS). 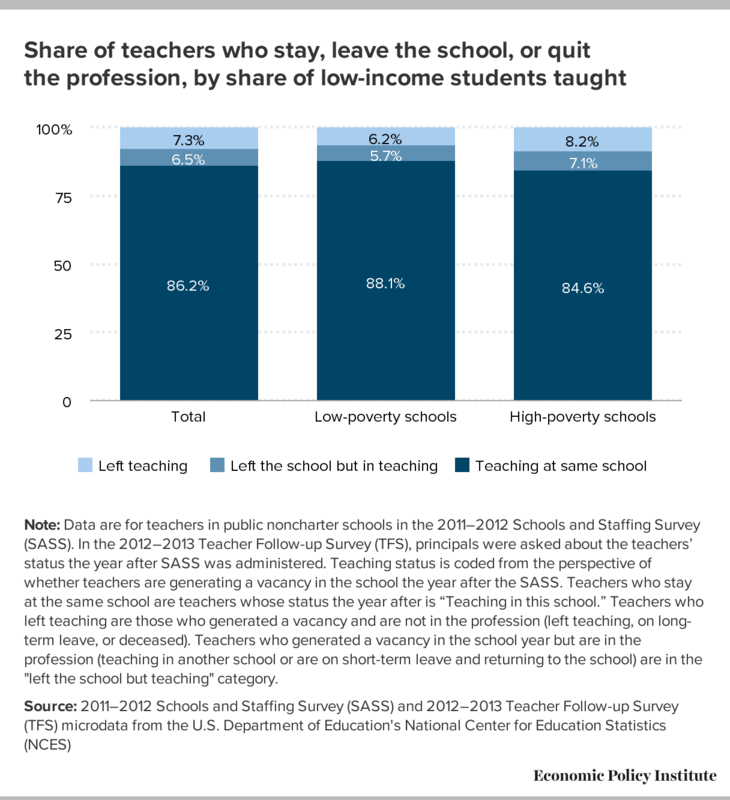 Teachers who quit are those who generated a vacancy in the 2012–2013 school year and are not in the profession (they left teaching, were on long-term leave, or were deceased). According to research and to the U.S. Department of Education, highly qualified teachers have the following four credentials: They are fully certified (with a regular, standard state certificate or advanced professional certificate versus not having completed all the steps); they took a traditional route into teaching (participated in a traditional certification program versus an alternative certification program, the latter of which is defined in the teacher survey questionnaire as “a program that was designed to expedite the transition of nonteachers to a teaching career, for example, a state, district, or university alternative certification program”); they are experienced (have more than five years of experience); and they have a background in the subject of main assignment; i.e., they have a bachelor's or master's degree majoring in the main teaching assignment field (general education, special education, or subject-matter specific degree) versus having no educational background in the subject of main assignment. The figure also provides information on an additional qualification—certification by the National Board for Professional Teaching Standards (NBPTS) in at least one content area. A teacher is in a low-poverty school if less than 25 percent of the student body in his/her class is eligible for free or reduced-price lunch programs; a teacher is in a high-poverty school if 50 percent or more of the student body she/he teaches are eligible for those programs. Teaching status is determined by the reported status of teachers in the Teacher Follow-up Survey conducted for the 2012–2013 school year, one year after the Schools and Staffing Survey. 23.7% 15.9% 13.2% 13.0% 13.0% 12.7% 12.0% 11.7% 11.4% 10.8% 10.1% 9.4% 8.8% 8.5% 8.3% -3.5 ppt. -2.4 ppt. -3.7 ppt. 21.0% 11.6% 10.1% 8.5% 7.2% 6.9% 6.4% 6.1% 6.1% 5.9% 5.7% 5.3% 4.8% 4.5% 4.4% -1.8 ppt. -1.4 ppt. -2.0 ppt. 37.2% 32.0% 25.5% 27.0% 29.1% 28.9% 27.0% 26.3% 25.3% 23.7% 21.9% 20.5% 19.3% 18.6% 18.1% –8.4 ppt. -5.1 ppt. -8.9 ppt. 9.3% 7.4% 5.9% 5.3% 5.5% 5.7% 5.8% 5.8% 5.9% 5.9% 6.0% 6.2% 6.6% 6.6% 7.0% 0.8 ppt. 0.7 ppt. 1.2 ppt. * Almost the entire change was driven by the increase in the number of enrollees in these programs in Texas. Note: Data include totals for 50 states and the District of Columbia. IHE stands for institution of higher education. IHEs offer traditional and alternative teacher preparation programs. Alternative–not IHE refers to an alternative teacher preparation program provided by an entity other than an IHE. 93.1% 89.6% 3.5 ppt. 91.3% 90.0% 1.3 ppt. 89.6% 88.8% 0.8 ppt. 83.3% 77.7% 5.6 ppt. 83.7% 79.0% 4.7 ppt. 78.6% 75.4% 3.2 ppt. 72.5% 68.8% 3.7 ppt. 67.1% 59.3% 7.8 ppt. Notes: Data are for teachers in public noncharter schools. According to research and to the U.S. Department of Education, highly qualified teachers have the following four credentials: They are fully certified (with a regular, standard state certificate or advanced professional certificate versus not having completed all the steps); they took a traditional route into teaching (participated in a traditional certification program versus an alternative certification program, the latter of which is defined in the teacher survey questionnaire as “a program that was designed to expedite the transition of nonteachers to a teaching career, for example, a state, district, or university alternative certification program”); they are experienced (have more than five years of experience); and they have a background in the subject of main assignment; i.e., they have a bachelor's or master's degree majoring in the main teaching assignment field (general education, special education, or subject-matter specific degree) versus having no educational background in the subject of main assignment. A teacher is in a low-poverty school if less than 25 percent of the student body in his/her class is eligible for free or reduced-price lunch programs; a teacher is in a high-poverty school if 50 percent or more of the student body she/he teaches are eligible for those programs. Teaching status is determined by the reported status of teachers in the Teacher Follow-up Survey conducted for the 2012–2013 school year, one year after the Schools and Staffing Survey. Teachers who stay at the same school are teachers whose status the year after is “Teaching in this school.” Teachers who left teaching are those who generated a vacancy in the 2012–2013 school year and are not in the profession (they left teaching, were on long-term leave, or were deceased). Not included in the table are teachers who generated a vacancy in the school year but remained in the profession (i.e., left to teach in another school or were on short-term leave and planned to return to the school). 1. For a more detailed review of the media coverage of the shortage, see García and Weiss 2019a. 2. Teacher demand-side drivers are linked to the need for teachers, i.e., how many teachers are needed for a given number of students with a given set of needs, or with the size of school budgets. Supply-side drivers are linked to the number of qualified people who are available and willing to teach, i.e., the number of people interested in and training to be teachers and the attachment existing teachers feel to the profession. 3. Sorensen and Ladd note that class sizes did not generally increase as a result of high teacher turnover in North Carolina, likely because of state policies that preclude increasing class size to accommodate teacher vacancies. On average, across math and English language arts (ELA) classes in middle school, 20.9 percent of teachers have three or fewer years of experience, 12.0 percent have lateral or provisional licenses, and 29.5 percent are teaching out of their subject of certification. Licensure exam scores of middle school math and ELA teachers are, on average, 0.13 standard deviations below the mean of all teachers. For a comparison with national-level shares, see García and Weiss 2019a. 4. This finding contrasts with prior suggestions by Hanushek and others that, because teachers who leave tend to be less able and skilled, their exit will improve the quality of a schools’ teaching pool (Hanushek and Rivkin 2007). This perspective reduces pressure to adopt policies that encourage the retention of teachers, overlooking the trade-off between the qualifications and quality of teachers who leave and those who come (Sorensen and Ladd 2018). 5. 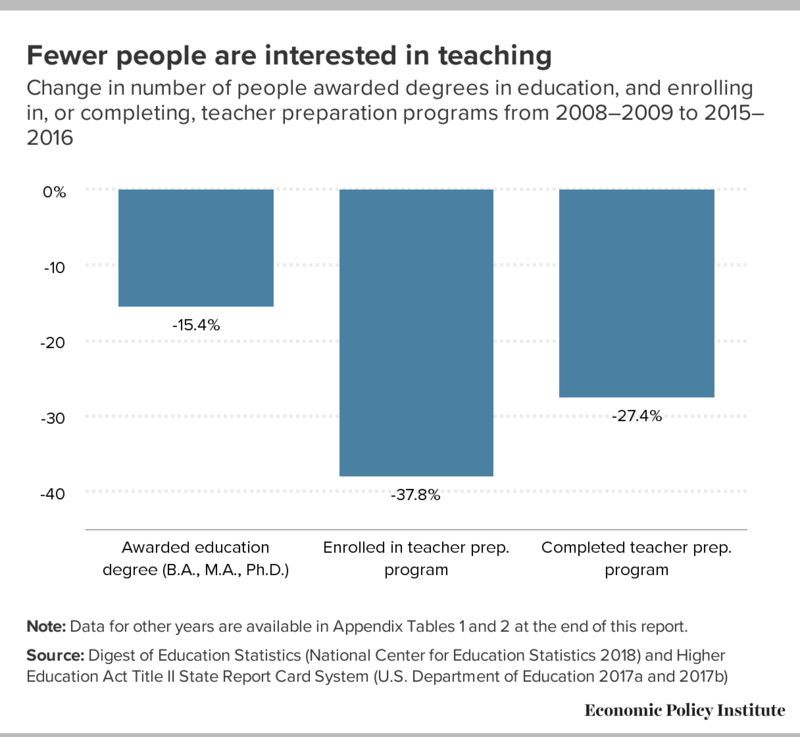 Notwithstanding this evidence of the short-term decrease in people awarded teaching degrees or completing teacher preparation programs, Cowan et al. (2016) note that “teacher production has grown steadily since the mid-1980s.” They add that this increase “has more than kept up with increases in student enrollment in public schools.” The long-term view provides a broader context but in a way hides short-term issues that more closely affect today’s teacher labor markets. Indeed, the short-term trend is one in which the number of pupils increased, so unless there is an intention to scale back staffing, any decline of the teacher pool is problematic. 6. Traditional teacher preparation programs are typically undergraduate programs offered by institutions of higher education (IHEs) and entered into by individuals who enter college with the goal of becoming a teacher (U.S. Department of Education 2016). (Programs at IHEs leading to a master’s of the arts degree in education are also often considered traditional programs.) Alternative programs are almost exclusively post-baccalaureate programs that require a bachelor’s degree for admission to the program, offered by IHEs, private or nonprofit organizations, state or local education agencies, or partnerships of entities. (For main differences between traditional and alternative teacher preparation programs, see U.S. Department of Education 2015 and U.S. Department of Education 2016.) The requirements for alternative routes to a teaching certificate vary significantly across states. 7. Teachers from alternative routes have been found to be more effective in some studies (Xu, Hannaway, and Taylor 2011), as effective as teachers from traditional programs in other research (Whitford, Zhang, and Katsiyannis 2017, Clark et al. 2017; Kane, Rockoff, and Staiger 2008), and less effective than their peers (Darling-Hammond et al. 2005). After assessing the pros and cons of both types of programs, Fraser and Lefty (2018) acknowledge that “advocates for alternative approaches claim that education schools are hopelessly stuck and unlikely to reform, and that alternative routes represent the optimal way to prepare new teachers for twenty-first-century classrooms” but conclude that “the university is the proper home for teacher preparation and that the rise of alternative routes is a mostly negative development. 8. Moreover, in our analysis of the National Teacher and Principal Survey (NTPS) 2015–2016 data (to be published in a forthcoming paper in this series), we find that, on average, teachers who enter teaching from alternative programs feel less prepared to do their jobs in the classroom (García and Weiss 2019b). 9. Vacancies and hires may happen for any of a number of reasons, including a school’s need to replace teachers who left the school or quit teaching, to increase the number of teachers in order to offer additional subjects or reduce the student-to-teacher ratio, to adapt to increases in student enrollment, etc. These factors, which differ across schools, may point to greater difficulties hiring in some schools, but our data do not allow us to explore vacancies that arise due to curriculum changes and other factors mentioned in this note. 10. A school may end up filling in a vacancy in a temporary manner, or may make some adjustment to cover the vacancy, for example by expanding a class size or finding an underprepared teacher. 11. See Ingersoll (2014) for a comparison of attrition among teachers and their peers in most occupations (discussed later in this report). See Goldring, Taie, and Riddles (2014) for the evolution of rates of stayers, movers, and leavers among public school teachers between 1988–1989 and 2012–2013 (Table 1 in their report). See Darling-Hammond et al. (2017) for some notes on the attrition and turnover rates in the U.S. and other jurisdictions. Some of the comparisons yield only modest gaps. 12. These shares are based on data that follows individuals over time, whereas the information in Table 4 is based on the characteristics of the 2011–2012 teaching cohort. They offer complementary information to each other. 13. Using the SASS data and classifying schools by eligibility of Title I funds, Sutcher et al. (2016) find that attrition of full-time teachers was approximately 55 percent higher in high-poverty schools (schools eligible for Title I funds) than in low-poverty schools (schools ineligible for Title I). Using data from North Carolina, Sorensen and Ladd (2018) find that “an urban school with high levels of student poverty faces an average turnover rate of over 34 percent versus just above 20 percent in low-poverty rural schools” (p. 13). Title I of the Elementary and Secondary Education Act of 1965 (20 U.S.C. 6301 et seq.) provides financial assistance to local educational agencies (LEAs) and public schools with high numbers or percentages of poor children to help ensure that all children meet challenging state academic content and student academic achievement standards. 14. See summary in García and Weiss (2019a). A caveat is that the credentials by teaching status are not independent from the reasons why teachers stay, quit, or leave. For example, teachers who are close to retirement are likely to have more experience, be fully certified, etc.). 15. 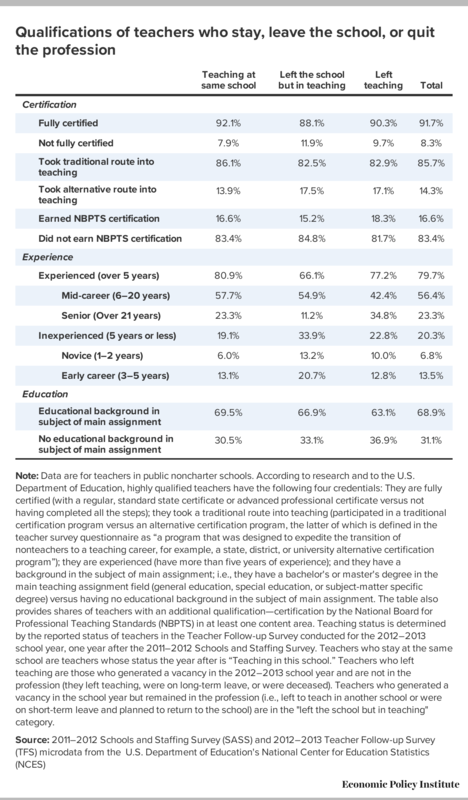 The share of teachers who are certified by the NBPTS is larger among teachers who leave the profession than among teachers who stay (18.3 percent versus 16.6; this may be driven by teachers who are retiring). 16. Early career teachers are more likely to quit than middle-career teachers (Allensworth, Ponisciak, and Mazzeo 2009; Guarino, Santibáñez, and Daley, 2006; Ingersoll 2001). Podolsky et al. 2016 estimate that attrition rates after five years in teaching are “at least” 19 percent using longitudinal data and explain that the rate with national cross-sectional data was about 30 percent (Podolsky et al. 2016; Darling-Hammond and Sykes 2003). 18. The share of certified teachers who quit is larger (a gap of 0.4 percentage points), and the share of NBPTS certified teachers is larger (by 6.1 percentage points). The share of teachers who entered the profession following alternative certification programs is smaller (by 11.1 percentage points), and a substantially smaller share has an educational background in the subject of main assignment (by 9.5 percentage points). 19. The shortage could occur even if demand were decreasing or staying constant, if supply decreased more drastically, or if supply stayed constant (or increased insufficiently). A shortage can be explained starting from a change in demand, or starting from a change in supply, as it is a gap, or difference, or imbalance between two curves. 20. The 2015–2016 NTPS does not produce state-representative estimates. The forthcoming 2017–2018 NTPS will support state-level estimates. 21. The forthcoming 2017–2018 NTPS additionally includes the private sector. 22. Information for completers is available for school years before 2008–2009, but not for the breakdown by type of institution shown in the tables. Allensworth, Ellen, Stephen Ponisciak, and Christopher Mazzeo. 2009. The Schools Teachers Leave: Teacher Mobility in Chicago Public Schools. Consortium on Chicago School Research at the University of Chicago Urban Education Institute, June 2009. Carroll, T.G. 2007. Policy Brief: The High Cost of Teacher Turnover. National Commission on Teaching and America’s Future. Carver-Thomas, Desiree, and Linda Darling-Hammond. 2017. Teacher Turnover: Why It Matters and What We Can Do About It. Learning Policy Institute, August 2017. Clark, Melissa A., Eric Isenberg, Albert Y. Liu, Libby Makowsky, and Marykate Zukiewicz. 2017. Impacts of the Teach for America Investing in Innovations Scale-Up. Mathematica Policy Research, February 2017. Cowan, James, Dan Goldhaber, Kyle Hayes, and Roddy Theobald. 2016. “Missing Elements in the Discussion of Teacher Shortages.” Educational Researcher 45, no. 8: 460–462. https://doi.org/10.3102/0013189×16679145. Darling-Hammond, Linda, Dion Burns, Carol Campbell, A. Lin Goodwin, Karen Hammerness, Ee-Ling Low, Ann McIntyre, Mistilina Sato, and Ken Zeichner. 2017. Empowered Educators: How High-Performing Systems Shape Teaching Quality Around the World, 1st Edition. San Francisco: Jossey-Bass. Darling-Hammond, Linda. 1999. Teacher Quality and Student Achievement: A Review of State Policy Evidence. Center for the Study of Teaching and Policy, University of Washington, December 1999. Darling-Hammond, Linda, Deborah J. Holtzman, Su Jin Gatlin, and Julian Vasquez Heilig. 2005. Does Teacher Preparation Matter? Evidence about Teacher Certification, Teach for America, and Teacher Effectiveness. Education Policy Analysis Archives 13, no. 42. https://doi.org/10.14507/epaa.v13n42.2005. Darling-Hammond, Linda, and Gary Sykes. 2003. “Wanted: A National Teacher Supply Policy for Education: The Right Way to Meet the ‘Highly Qualified Teacher’ Challenge.” Education Policy Analysis Archives 11, no. 33. Fraser, James W., and Lauren Lefty. 2018. Three Turbulent Decades in the Preparation of American Teachers: Two Historians Examine Reforms in Education Schools and the Emergence of Alternative Routes to Teaching. Johns Hopkins School of Education, Institute for Education Policy, September 2018. García, Emma, and Elaine Weiss. 2019a. The Teacher Shortage Is Real, Large and Growing, and Worse Than We Thought: Report 1 in the “Perfect Storm in the Teacher Labor Market” series. Economic Policy Institute, March 2019. García, Emma, and Elaine Weiss. 2019b. Insufficient Teacher Preparation and Support Challenge Recruitment and Drive Exits, Especially in High-Poverty Schools. Report 5 in the “Perfect Storm in the Teacher Labor Market” series. Economic Policy Institute, forthcoming 2019. Goldring, Rebecca, Soheyla Taie, and Minsun Riddles. 2014. Teacher Attrition and Mobility: Results From the 2012–13 Teacher Follow-up Survey (NCES 2014-077). U.S. Department of Education. Washington, DC: National Center for Education Statistics. Guarino, Cassandra M., Lucrecia Santibáñez, and Glenn A. Daley. 2006. “Teacher Recruitment and Retention: A Review of the Recent Empirical Literature.” Review of Educational Research 76, no. 2: 173–208. Hanushek, Eric A., and Steven G. Rivkin. 2007. “Pay, Working Conditions, and Teacher Quality.” The Future of Children 17, no. 1: 69–86. Hanushek, Eric A., Steven G. Rivkin, and Jeffrey C. Shiman. 2016. “Dynamic Effects of Teacher Turnover on the Quality of Instruction.” National Center for Analysis of Longitudinal Data in Education Research (CALDER) Working Paper no. 170, November 2016. Ingersoll, Richard M. 2001. “Teacher Turnover and Teacher Shortages: An Organizational Analysis.” American Educational Research Journal 38, no. 3: 499–534. https://doi.org/10.3102/00028312038003499. Ingersoll, Richard M. 2004. “Revolving Doors and Leaky Buckets.” In Letters to the Next President: What We Can Do about the Real Crisis in Public Education, edited by Carl D. Glickman, 141–150. New York: Teachers College Press. Ingersoll, Richard M. 2014. “Why Do High-Poverty Schools Have Difficulty Staffing Their Classrooms with Qualified Teachers?” Presentation for panel discussion How Do We Get Experienced, Accomplished Teachers into High-Need Schools?,” Albert Shanker Institute, October 8, 2014. Kane, Thomas J., Jonah E. Rockoff, and Douglas O. Staiger. 2008. “What Does Certification Tell Us About Teacher Effectiveness? Evidence from New York City.” Economics of Education Review 27, no. 6: 615–631. Kraft, Matthew A., and John P. Papay. 2014. “Can Professional Environments in Schools Promote Teacher Development? Explaining Heterogeneity in Returns to Teaching Experience.” Educational Evaluation and Policy Analysis 36, no. 4: 476–500. Ladd, Helen F., and Lucy C. Sorensen. 2016. “Returns to Teacher Experience: Student Achievement and Motivation in Middle School.” Education Finance and Policy 12, no. 2: 241–279. Leachman, Michael, Kathleen Masterson, and Eric Figueroa. 2017. A Punishing Decade for School Funding. Center on Budget and Policy Priorities, November 2017. Leachman, Michael, and Eric Figueroa. 2019. K-12 School Funding Up in Most 2018 Teacher-Protest States, But Still Well Below Decade Ago. Center on Budget and Policy Priorities, November 2017. Learning Policy Institute (LPI). 2017. What’s the Cost of Teacher Turnover? (calculator). September 2017. National Center for Education Statistics (NCES) (U.S. Department of Education). 2017. Documentation for the 2011–12 Schools and Staffing Survey. March 2017. National Center for Education Statistics (NCES) (U.S. Department of Education). 2018. Digest of Education Statistics: 2018. National Center for Education Statistics (NCES) (U.S. Department of Education). 2019. “NTPS Overview” (web page), accessed March 2019. Podolsky, Anne, Tara Kini, Joseph Bishop, and Linda Darling-Hammond. 2016. Solving the Teacher Shortage: How to Attract and Retain Excellent Educators. Learning Policy Institute, September 2016. Redding, Christopher, and Thomas M. Smith. 2016. “Easy In, Easy Out: Are Alternatively Certified Teachers Turning Over at Increased Rates?” American Educational Research Journal 53, no. 4: 1086–1125. https://doi.org/10.3102/0002831216653206. Ronfeldt, Matthew, Susanna Loeb, and James Wyckoff. 2013. “How Teacher Turnover Harms Student Achievement.” American Educational Research Journal 50, no. 1: 4–36. Sorensen, Lucy C., and Helen Ladd. 2018. “The Hidden Costs of Teacher Turnover.” National Center for Analysis of Longitudinal Data in Education Research (CALDER) Working Paper no. 203-0918-1, September 2018. Sutcher, Leib, Linda Darling-Hammond, and Desiree Carver-Thomas. 2016. A Coming Crisis in Teaching? Teacher Supply, Demand, and Shortages in the U.S. Learning Policy Institute, September 2016. U.S. Department of Education. 2015. Alternative Teacher Preparation Programs, June 2015. U.S. Department of Education. 2016. Preparing and Credentialing the Nation’s Teachers: The Secretary’s 10th Report on Teacher Quality, August 2016. U.S. Department of Education. 2017a. “Completers, by State, by Program Type” [data table]. Data from the Higher Education Act Title II State Report Card (SRC) Reporting System. Spreadsheet downloadable at https://title2.ed.gov/Public/DataTools/NewExcels/CompletersProgramType.aspx. U.S. Department of Education. 2017b. “Enrollment, by State, by Program Type” [data table]. Data from the Higher Education Act Title II State Report Card (SRC) Reporting System. Spreadsheet downloadable at https://title2.ed.gov/Public/DataTools/NewExcels/EnrollmentProgramType.aspx. U.S. Department of Education. 2017c. “Requirements for an Initial Teaching Credential, by State” [data table]. Data from the Higher Education Act Title II State Report Card (SRC) Reporting System. Spreadsheet downloadable at https://title2.ed.gov/Public/DataTools/NewExcels/Requirements.aspx. U.S. Department of Education. 2017d. “States Requiring Content Specific Bachelor’s Degrees for All Initial Teaching Credentials” [data table]. Data from the Higher Education Act Title II State Report Card (SRC) Reporting System. Spreadsheet downloadable at https://title2.ed.gov/Public/DataTools/NewExcels/ContentDegrees.aspx. U.S. Department of Education. 2017e. Higher Education Act Title II State Report Card (SRC) Reporting System [data series]. Office of Postsecondary Education. Data accessed via data tools at https://title2.ed.gov/Public/DataTools/Tables.aspx. Whitford, Denise K., Dake Zhang, and Antonis Katsiyannis. 2017. “Traditional vs. Alternative Teacher Preparation Programs: A Meta-Analysis.” Journal of Child and Family Studies 27, no. 3: 671–685. Xu, Zeyu, Jane Hannaway, and Colin Taylor. 2011. “Making a Difference? The Effects of Teach For America in High School.” Journal of Policy Analysis and Management 30, no. 3: 447–469. https://doi.org/10.1002/pam.20585.